On the heels of their controversial collision which resulted in a hotly disputed decision, former World Boxing Council (WBC) middleweight champion and Son of the Legend JULIO CÉSAR CHÁVEZ JR. and Top-Five contender and two-fisted Texan BRYAN VERA will square off in a 12-round super middleweight battle in a rematch to settle their score once and for all. This time Vera will enjoy the home court advantage when they meet, Saturday, March 1, at the Alamodome in San Antonio, TX. 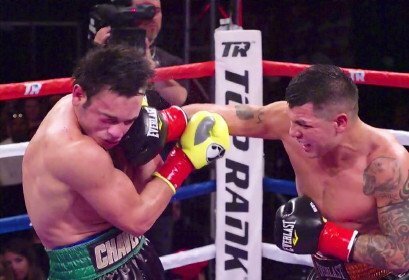 Chávez Jr. vs. Vera II will be televised live on HBO World Championship Boxing, beginning at 9:45 p.m. ET/PT. The telecast will open with two-time Ukrainian Olympic gold medalist and 2013 Prospect of the Year, VASYL LOMACHENKO, in only his second professional bout, challenging World Boxing Organization (WBO) featherweight champion ORLANDO SALIDO. “People are going to see I have the fire and hunger back. I have been training for five months and my weight is perfect. “The last time we fought, I was coming off a hurtful loss and was out of the ring for over a year. While training to fight Vera I made a call to Bob Arum saying I was having a weight problem and needed help. “In that fight I was maybe 40 or 50 percent of myself and deep inside I knew it would be a difficult fight. “I controlled the first fight and connected on more punches. “I plan to beat Chávez decisively this time. I have fans from all parts of Texas plus former fans of Chávez who are now on my side because of what happened in our first fight. “He is a big guy and is hard to hurt. In our first fight I thought the crowd over reacted when he landed a few punches. He ran around a lot, not fighting like he did against Andy Lee. “I thought I won the first fight. My trainer Ronnie Shields thought so too, and that got everyone in my corner excited. When I heard a 98-92 score my heart told me I would not get my hand raised. I was in sudden shock.